Lamp Revival creates quirky recycled table lamps and hanging lights from salvaged and vintage lamps, electrical parts and pipe fittings. For the past 10 years, the company has been operating out of Rockland, Maine, creating unique lamps out of old, discarded materials. In one of their most impressive creations, the folks at Lamp Revival used pipe fittings and sheet metal to create a jacket and bow-tie for the Fred Astaire lamp, and they used two recycled Victorian glass shades to create a matching lamp that looks like Ginger Rogers striking a dynamic pose. Check out Lamp Revival’s website to see all of their unique and nostalgic lamps. Lamp Revival creates quirky recycled table lamps and hanging lights from salvaged and vintage lamps, electrical parts and pipe fittings. For the past 10 years, the company has been operating out of Rockland, Maine, creating unique lamps out of old, discarded materials. 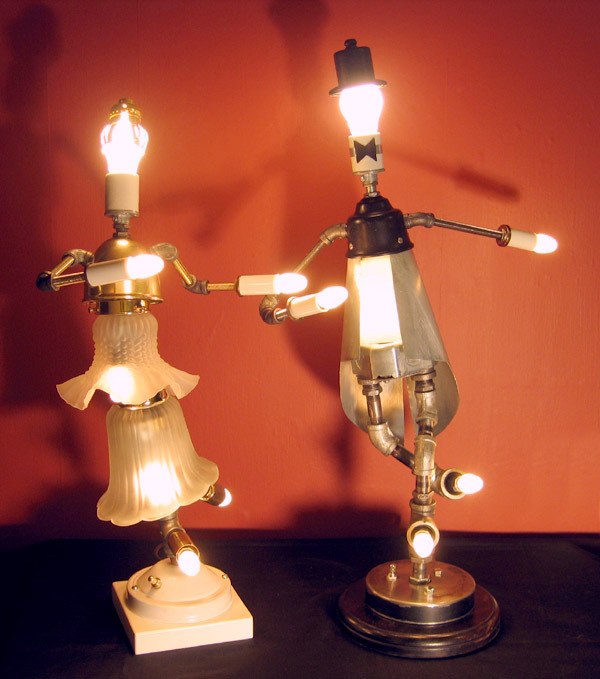 In one of their most impressive creations, the folks at Lamp Revival used pipe fittings and sheet metal to create a jacket and bow-tie for the Fred Astaire lamp, and they used two recycled Victorian glass shades to create a matching lamp that looks like Ginger Rogers striking a dynamic pose. Check out Lamp Revival's website to see all of their unique and nostalgic lamps.